The God of Wine is lookinâ for love. And he has absolutely no clue what heâs doing. Acan, the God of Wine and Intoxication, has been partying for over ten thousand years. And New Yearâs Eve, when humans around the world succumb to his naturally occurring spike in powers, is his big night. Only this year, things are bit different. A plague is sweeping the immortal community, and heâs turning downright evil. All those New Yearâs bashes will turn into bloodbaths if he doesnât stop it. Sadly, the only known cure is finding a mate, and he is a giant, rude, beer-bellied mess. Definitely not husband material. So watch out, ladies! 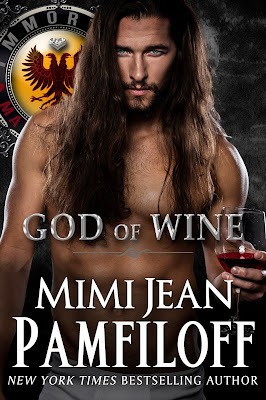 The God of Wine is lookinâ for love. And he has absolutely no clue what heâs doing.